The nature of energy supply in the UK and around the globe is changing. The shift is driven by an expanding global population, increasing challenges in extracting natural resources and growing acceptance of the impact of carbon on our climate. The media is filled with, often partisan, views on what this evolving energy supply should look like. Some would prefer no hydrocarbons are burnt, particularly not those extracted by 'fracking'. It's also not hard to find both strong proponents and strong opponents of wind, tidal, nuclear or biomass. However the reality is that our future energy mix will require some combination of all of these. The International Energy Agency foresee that in 2030 some 75% of our energy needs will come from carbon based fuels with the balance made up from low carbon sources such as nuclear and wind. The large energy companies such as oil majors and electricity utilities publish similar views of our energy future. The 75% target for carbon based energy is a reduction from that which pertains today (about 85%). This might not sound like a large reduction but there is an underlying challenge which is associated with the energy needs of population growth in the developing nations. Such nations will reasonably argue that they should not have to shoulder the financial burden of low carbon generation to compensate for the sins of those who have already benefited from pumping tons of carbon into atmosphere. This argument has some way to run yet but it seems reasonable that the developed nations will need to be particularly pro-active in de-carbonisation. Current UK energy policy reflects just such a stance. The scale of the challenge globally is unprecedented with, according to the International Energy Agency, an estimated $26 trillion needing to be spent between now and 2030 on developing new sources of natural resources and building new power plant. From an engineer's perspective this is certainly the biggest challenge of our age and possibly even the biggest ever infrastructure challenge industrialised society has faced. Large though the challenge is, it can be broken down into two essential needs which, if met, make everything possible. These are human capital and investment capital. With the skills and the finance we can build what is required. Regrettably, today neither is in abundant supply. Taking a UK perspective we can consider what the energy engineering challenges will be over the coming decades. We can start with a resurgent oil & gas industry - previous predictions of its demise seem way off the mark with Aberdeen our oil capital at its busiest ever. The industry has yet to extract much of the available oil & gas from around our shores (an estimated 20 billion barrels to go with 40 billion having already been produced). This will involve building new facilities and the not inconsiderable task of maintaining the existing yet ageing infrastructure. Added to this may be some level of shale gas development. Beyond the extraction of hydrocarbons, the offshore wind industry is now well underway with an expectation that some 30GW will be installed (this is of order 5-10,000 individual turbines) in the coming decade. It seems probable that the UK will build its first nuclear power stations since Sizewell B was commissioned in 1995 - how many is not certain but EdF and Horizon have advanced plans which allow for four twin reactor sites. We should see at least one carbon capture and storage project. A number of coal to biomass conversions will take place. Gas storage facilities will be built - possibly also other more novel storage solutions. Finally it is highly likely that additional gas fired capacity will be required if only to provide back-up to the large investment in offshore wind. Little, if any, of this endeavour will be straightforward. Advanced skills will be needed during both the design and construction phases. It can be argued that the most critical resources are 'architects' of this change - the professional engineers - in old school parlance the folk that can build for a fiver what anyone could build for a tenner. Except in this case the stakes are somewhat higher. From a professional engineering perspective at Atkins we estimate that an additional 20,000 personnel will be needed in the UK to deliver this investment programme. Figure 1 illustrates the nature of the challenge. The aim is to increase the number of personnel who have reached what has become known as 'the point of autonomy' - able to operate reasonably independently in a professional capacity. Growth in the number of people at this level of attainment can only be by three mechanisms. One is to build from the bottom which in the engineering world means recruitment of graduates followed by a period of training. Another is to move engineers in from other industries perhaps with the need for a period of familiarisation with their new environment. 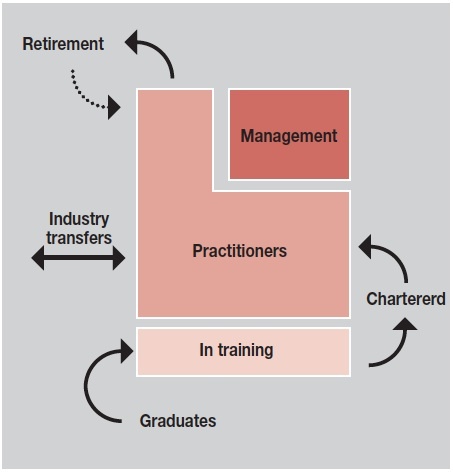 The final route is to stop people leaving the profession - this becomes critical against a backdrop of an increasing rate of retirement from the nuclear and oil & gas industries in particular as baby boomers reach the scheduled end of their careers in increasing numbers. Whilst the challenge is large there are causes for optimism. As a country we are adaptable. At a certain point in the 70's we had no indigenous offshore oil & gas industry yet today it employs some 400,000 professionals. Over a relatively short period of time we moved from virtually no pre-existing capability to a position where our skill base was recognised around the world. With this mind-set today's energy challenges may yet be met but it will require the dynamism for which the oil industry is well known to be applied right across the energy sector. As we stand today, recent research by The Royal Academy of Engineering confirms that even whilst still emerging from a recession the demand for Science, Engineering and Technology graduates significantly outstrips supply. Overlaying a backdrop of increasing economic activity and then the specific and substantial challenges of the energy industry it would appear that the problem is potentially acute. An 8% increase in applications to engineering courses in 2013 gives cause for optimism but clearly there is much more to be done and it remains to be seen whether we can achieve a significant re-basing of our educational effort towards science and engineering. The overall limitation in engineering personnel across all sectors suggests that moving skilled personnel from other industries will be challenging. However there are areas of opportunity. The armed services for example are being reduced in numbers and many of the personnel becoming available have exactly the skill sets that the energy industry requires. There are other opportunities that the industry can pursue. Correcting the current woeful gender balance and increasing diversity in other areas would open up significant additional resource. There is also an increasing tendency for skilled individuals to not cease work upon reaching retirement age - assisted in part by recent legislative change and also by declining pension provision. The challenge is therefore substantial but indications are that we are moving to meet it. Probably not quickly enough though which raises the question - what happens if we cannot provide the resources? Will we not build what is required? This seems unlikely particularly when the lights start to dim. More likely the answer lies in the fact that in the UK some 23,000 engineers are graduating every year but India is producing eight times as many, and China twenty times. It can be argued that there is not strict equivalence in the definition of engineer across these countries which may lead to some over-estimation of capability but even so the threat is real. The likelihood is therefore that the high value employment associated with our energy revolution would move overseas –to the detriment of our economy. We cannot allow this to happen. One might argue that investment is solely the realm of the financial expert rather than the engineer. However on deeper examination the engineer has a critical role. The investor is generally interested in the level of return on the investment and the level of associated risk. This is in turn essentially driven by a future sales price of the energy commodity and the level of expenditure required to build and operate the facility producing the commodity. The engineer cannot help with prediction of the sales price but will be required to provide enough design definition to allow estimation of the costs associated with the facility. It is here that we have a critical bottleneck associated with development of new energy infrastructure. There is by and large not a lack of investment funding available but it is usually seeking largely de-risked investment proposals. Uncertainty around out-turn cost of certain new energy developments is often seen as a blocker to investment. Where the facility is of a type that has been built a number of times previously historic cost data can be used and adapted as necessary. The cost risk is therefore lower and the investment case becomes a relatively straightforward exercise. However this is not the case when a novel facility is being built which often is the situation facing us today. There simply isn't the history of building the latest generation of nuclear reactors or large offshore wind farms or tidal barrages or carbon capture and storage facilities. Absent firm cost data the investment case becomes more challenging. It is common to see published barcharts comparing the cost of electricity generated using gas, coal, wind and nuclear. Less common is the use of appropriate error bars which will be much greater for example for offshore wind than gas due simply to the differing experience bases. The lack of such analysis encourages the previously noted partisan views about which technology is cheaper. The uncomfortable reality is that we may not know at this stage what the most economic solution is. This uncertainty associated with building new types of energy generation takes two distinct forms. There is firstly the uncertainty associated with building the 'first of a kind' (FOAK). For such facilities, there simply isn't the experience base to derive firm cost estimates with a low range of uncertainty. The second is what level of reduction we might see as more facilities are built and learning through experience brings the cost down. FOAK cost estimates can of course be made. This requires a bottom-up approach based on a certain level of design definition. The greater the design definition then the greater the cost certainty. However the effort and cost associated with achieving this design definition, being pre-investment, is itself at risk and only well funded developers will be able to absorb the cost. However, even with the correct level of design definition there will be the absence of comfort gained by a top down cross check based on experience with similar facilities. The other issue is that of the so-called 'learning curve'. We can bring down the cost of any type of facility by building a series and learning in the process. The concept has been studied in many areas notably aerospace and shipbuilding. The idea is that a certain reduction in unit cost applies for each doubling of production. Typically this can be about 20% but it is an empirical measure and may be more or less for particular technologies. Solar panels saw perhaps the biggest reduction for any energy technology - around 35% - which led to withdrawal of subsidies in certain European countries. It will be some time before we know what reduction we can expect for the latest generation of nuclear technology and for deepwater offshore wind. The UK government is working hard to design a solution to this problem via Electricity Market Reform which seeks inter alia to provide market support to emerging technologies. Without such intervention they simply would not get built. The setting of a strike price for new nuclear is a case in point. On one hand an overly generous deal would see the utility make super profit. On the other hand an insufficiently generous deal will result in stasis. In the grand scheme of things getting the balance right is desirable but of all the options stasis would be the most catastrophic in terms of energy security. In the UK we are embarking on a complete rebasing of our energy infrastructure. The human and financial resources required to do this will be substantial. At the moment both are in shorter supply than we would want. The situation is not hopeless and is eminently soluble within the timescales available. However procrastination resulting from lack of clarity on what needs to be done has many potentially undesirable outcomes. The starting point needs to be acceptance of the necessity of a broad based energy mix encompassing a sensible level of low carbon sources. This in turn allows us to focus on the need to unlock the finance and find the skills. Failure to do so will lead to an unreliable energy supply, a failure to halt climate change and a lost opportunity to capitalise on the next industrial revolution.